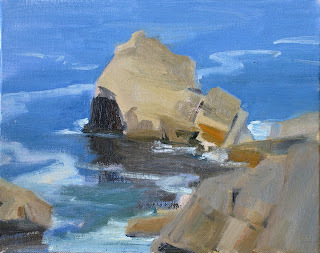 On Saturday I drove to Pebble Beach with a friend, Alice Weil, for a workshop at Brian Blood's studio. After a night of freezing temperatures, the day was cold and sunny with some beautiful cloud formations. The painting above is a study of the rocks and the ocean near Lover's Point. 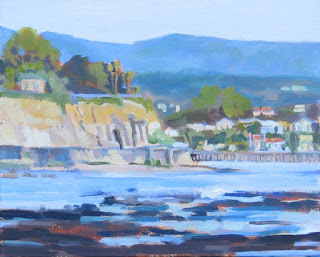 I completed the painting during a plein air workshop with Brian last summer. The coastline in Pebble Beach is lined with dramatic cliffs. The color of the ocean is almost unnatural looking with viridian greens and ultramarine blue. When painting the rocks I wanted to capture the reflection of the rocks in the ocean and the swirling motion of the water around the rocks. 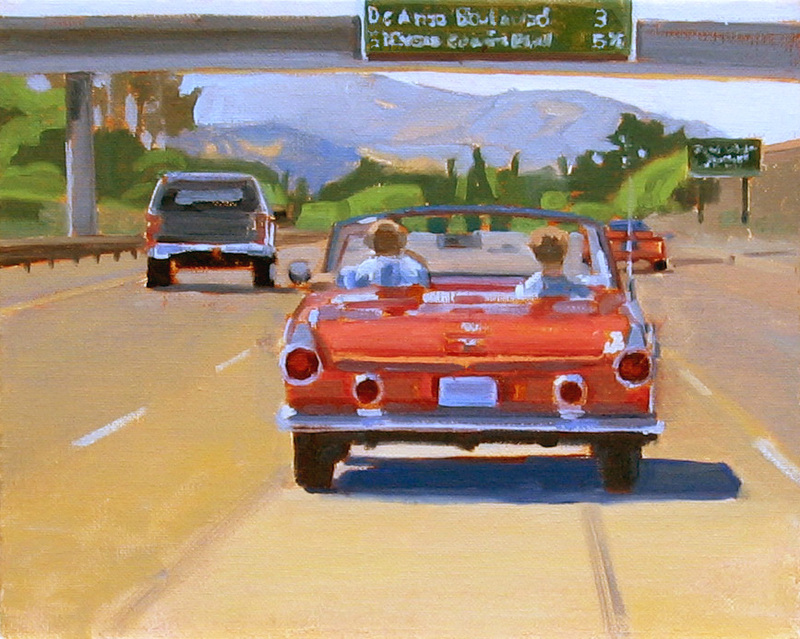 How quintessential California, a '55 Thunderbird cruising the 85 freeway with the top down on a sunny day in February. The car was a beautiful sporty two-seat red convertible, so I had to take a few photos as it passed us on the freeway. Not only is the T-bird part of California lore, but also Madison Avenue, as the Thunderbird was the first car marketed as a personal luxury vehicle. 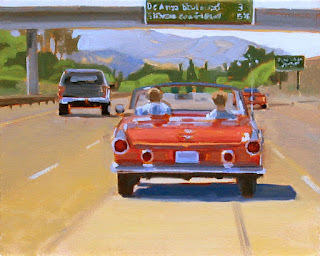 I used to avoid painting cars, even if they were in the scene I was painting, I would leave them out of my composition. However, there's something romantic about old cars. I've been looking at classic cars, like the VW van and Beetle and incorporating them into my work. Painting cars is a challenge, but it's fun to paint the shiny chrome, the reflections and the bright colors. During a recent trip to Santa Cruz, I watched the local school kids compete in an Interscholastic Surfing Federation competition. The boys were out in the water and the girls were on the beach, waiting for their heat. When the horn blared, signaling the end of the heat, the boys came in and the girls paddled out. It's great to see so many young girls surfing. 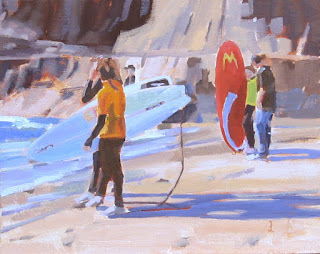 This painting makes me think of another surfer girl, my friend Alicia. Alicia and I spent two years surfing together at Mondos in Ventura. We went out a couple of times a week, encouraged each other and learned to surf. During the winter when the waves got big and the ocean was a churning mess of white water, Alicia had a rule: three and out. Paddle out, catch three waves and get out. You'd be amazed at how much energy and strength it takes to paddle out through the white water and stay in position to catch a wave without getting swept down the coast with the current. My admiration and respect goes out to all surfer girls. On Saturday, while Craig was surfing, I walked down the stairs to the beach. 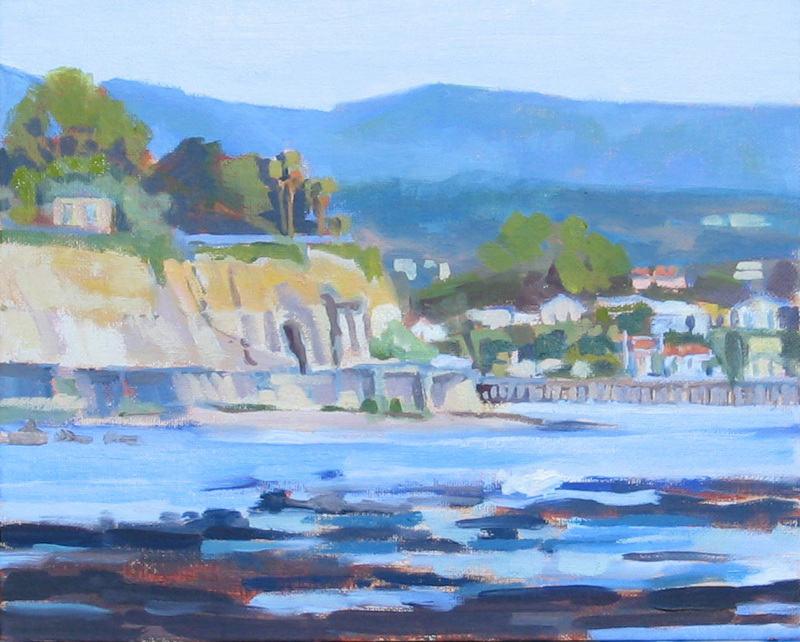 As I walked around the cliffs, I could see Capitola and the pier in the distance. It was a clear bright day, at low tide with the kelp beds exposed in the foreground. I took a photo and worked from the photo in my studio to create this painting.